I know that it seems silly, but I almost feel like a little kid waiting to unwrap a new gift for my birthday, when I get an order acknowledgement from A Taste of Monterey, my wine club. Since we belong to their Private Reserve Club, I know that there will be a decent cha-ching to the charge card, but there will be three new wines to think about and perhaps one of them will be tried in the months to come. One of the pleasures of having a medium size wine cellar is knowing that there is never a rush to open something, and the wines get a chance to relax after the shipping. Though the excitement and curiosity is still forever, it seems, lingering in the back of the brain as to when the new wines will be tasted. 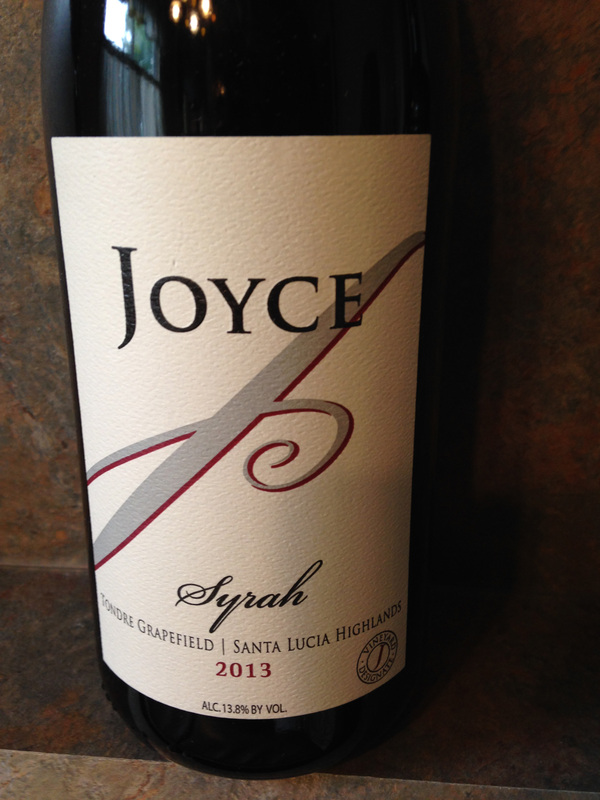 The first wine that I pulled out of the carton was Joyce Syrah Tondre Grapefield 2012 from the Santa Lucia Highlands of Monterey. I have a bottle of Joyce Pinot Noir Tondre Vineyards 2010 that I have still not tried. The notes on this wine is that 75% of the grapes were destemmed and while the balance were left as whole clusters and cold soaked for four to five days. The primary fermentation was almost two weeks, then pressed and put into a mix of new and neutral French Oak barrels. Once the malo-lactic fermentation was complete, there was sulfur added and the wine was left to age “sur lie” for thirteen months. The wine was then bottled unfined and unfiltered, so I am sure that this will be a full bodied wine, when it is opened, and should be earthier than most Syrah wines. The club recommends an aging potential of seven to eight years. The next bottle that I found was from a winery that we had visited Heller Estate. 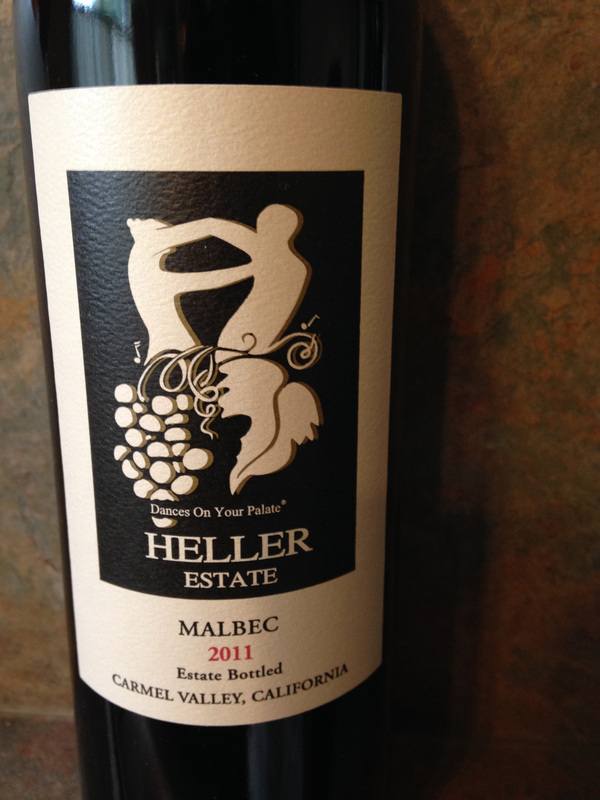 This bottle is of a varietal that was not being offered when we were there, so the Heller Malbec 2011 from the Carmel Valley shall be something new for me. Heller Estate after three years is now certified as 100% Organic, meaning that they use no herbicides or pesticides in the production of the grapes. This particular vintage year in Carmel was a bit dicey and each winery had to deal with an unusual growing season. The aging potential for this wine is also seven to eight years, but I may try it a bit sooner, just because of the year, though I expect it to be a classic Malbec with a good mix of fruit and tannins. The last bottle in the shipment, when I looked at the label was a bit different from what I usually see from the area. The wine is High Flyer Doctor’s Pinot Noir 2010 and of course it is one of my favorite varietals from the Monterey area. High Flyer is a small family owned winery, and this particular wine was produced with a total of seven hundred cases of wine. 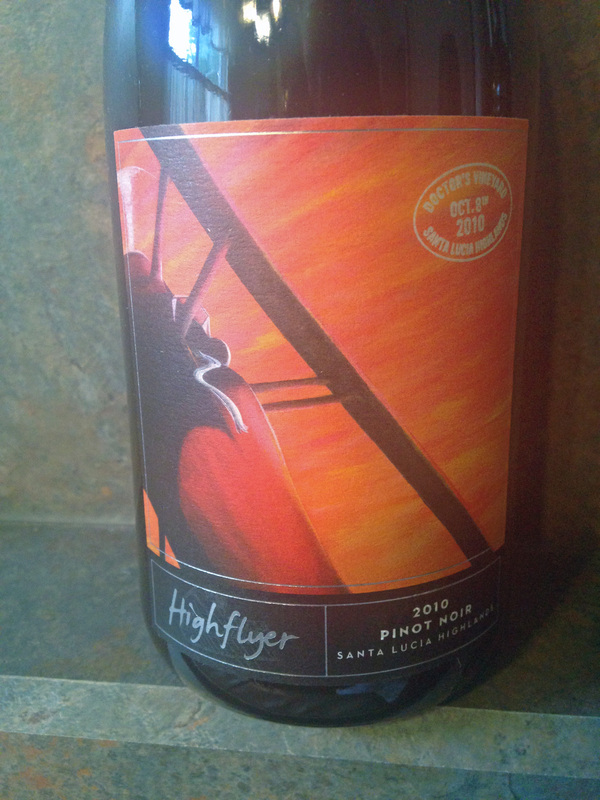 The winery is called High Flyer, because the other passion of the winemaker is being a private pilot. There were three different clones of Pinot Noir grown in Doctor’s Vineyard in the heart of the Santa Lucia Highlands. This wine was aged for twelve months in a mix of French Oak barrels, and the aging potential for this wine is five to six years, but it may not last that long, as it is a new winery to me, and as I said, one of my favorite varietals. This entry was posted in Wine and tagged "A Taste of Monterey", California, Carm, Doctor's Vineyard, Heller Estate, High Flyer, Joyce Vineyards, Malbec, Pinot Noir, Santa Lucia Highlands, Syrah, Tondre Vineyard. Bookmark the permalink. Thank you for posting these amazing articles all the time. I love wine and it is nice to always know more. Wine Clubs are an interesting phenomena. We don’t really have them here in Germany but they seem to be highly popular in the US. Looking forward to your tasting notes on these wines.